So I wanted to see how different they could be. One thing of interest to note is that the famous Sukiyabashi Jiro, that 3-star Michelin sushi-ya made even more famous internationally with the movie “Jiro Dreams of Sushi“, is located right opposite Bird Land. 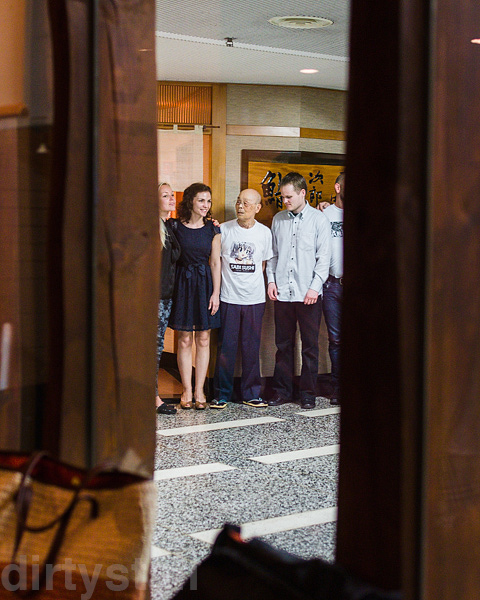 Just as I was sitting inside, the man himself came out with his patrons for a group shot, and I assume it was a famous chef with his friends because Jiro was wearing a cute anime girl tee over his chef clothes, which he took off once they took the photo. But enough about Jiro, back to Bird Land now. It’s basically a huge U-shaped counter that can seat about 30 people, around a open grill and preparation area. And there are some tables for groups to sit around too. Besides the usual ala carte items, Bird Land offers 2 omakase menus, priced at ¥6,000 and ¥8,000. I went for the latter of course. It opens with a platter of assorted appetizers. I don’t remember what the vegetables were, but the brown thing is marinated chicken skin, which wasn’t memorable. Then you have medium-rare chicken breast fillet, grilled on the outside, with option of topping it with Japanese apricot or sweet basil sauce. I think I preferred it with the apricot sauce, as it was more unique than the basil sauce, which was basically like pesto. Grilled skin of a red capsicum with olive oil. Quite liked this one, the skin was grilled nicely without charring it. This was a substitute for the chicken liver pate dish. Following that, the chef’s choices of 8 yakitori sticks. First is some sasami wasabi (chicken breast with wasabi). This is cold tofu that is meant to mimic a blob of mozzerella cheese, complete with a drizzle of EVOO, a sprinkle of salt, a grind of black pepper, and a small tomato. The European influence on Bird Land is strongest in this dish, and it was quite delicious as well, very clean in flavours and a good break after the rich chicken skin. Another break of green salad and tomato. Cacciocavallo cheese, grilled. Definitely unexpected but tasty nonetheless. A bit hard to eat though, I was constantly twirling it around so that it wouldn’t drop off the stick, like a slow ice-cream. Oyakodon. Decent but nothing compared to Toritsune Shizendou. And finally a crème caramel flan for dessert. All in all, it was a pretty good meal but somehow, it just felt too refined for me. I preferred the stronger flavours and more traditional feel of eating at places like Toriki. Still worth the visit of course, just to have a new and different experience in eating yakitori. 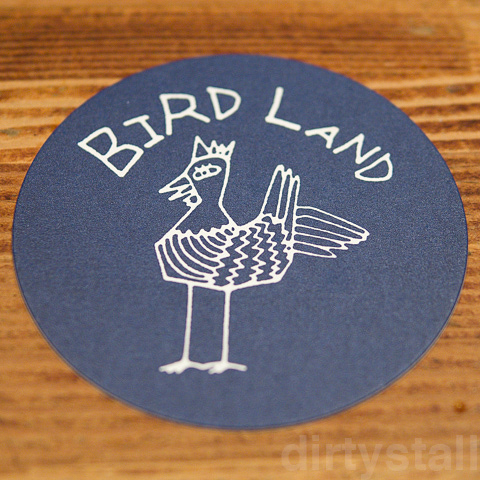 3 Responses to "Bird Land"
Hi, did you make a reservation at Birdland, or you walked in? I made a reservation there. Walk-in might be possible if you’re alone or a pair.